The Last 80 Degree Day? What a day! But was this it? The last taste of Summer? There’s a good chance it was if you look back at history. The average last 80 degree day of the season here in Portland is September 27th. We’ve gone through 5 Octobers (since 2004) without seeing that 80 degree mark. In fact last year we only had two days above 70, the year before only 3! 71 degrees was the best we could do in October 2009. This points out how quickly our weather cools (and turns wet) during the month of October. It’s the fastest changing month in our area. Average high temps cool from around 70 on the 1st to upper 50s by Halloween. No other month sees the temperature change so quickly. The quickly decreasing sun angle, long nights, and cooling continent finally catch up and overcome the warm late summer atmosphere. I dropped a bunch of the 7 Day forecast numbers because I felt they were just too warm for this time of year and the weather pattern. For example, it’s obvious that we’ll be socked in a westerly flow and saturated atmosphere below 5000′ on Sunday. On October 3rd that’s well down into the 60s…maybe ONLY 60. Tomorrow too, I think 79 is way too warm. It took great effort (offshore flow) to get us into the mid 80s today. Flow goes onshore tomorrow, so a 10 degree drop seems reasonable. Thursday should be the warmest day in 3+ weeks here in the Metro area with temps at least in the mid 80s, possibly upper 80s in a few spots too. The 00z Salem sounding was up to +18 deg. C. at 850mb and models forecast a +20 to +22 by tomorrow afternoon/evening. Then we add a good 4-5 millibars easterly gradient (it was flat today) through the Columbia Gorge and over the Cascades. That should give us far better surface heating, all the way out to the North Coast. 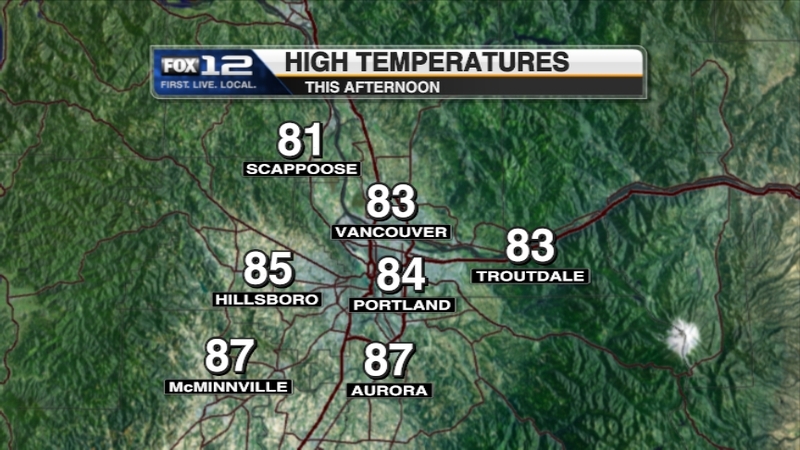 We’re going for 84 degrees at PDX, but I think anywhere between 83 and 88 is possible. 88 IS the record for the day at PDX too. A nice, warm (and dry!) end to a strange month. So what is a “Water Year”? Here in the Pacific Northwest a vast majority of our yearly precipitation (rain and snow) comes from Pacific frontal systems that move in regularly during the cool season; that would be October through March. In other parts of the country (especially east of the Rockies) it’s the opposite; most rainfall comes from summertime thunderstorms or active frontal boundaries in the warm season. Generally winters are the dry season in those areas. So if you want to measure how much precipitation fell each “rainy season” , it doesn’t do you much good to measure the calendar year rainfall. 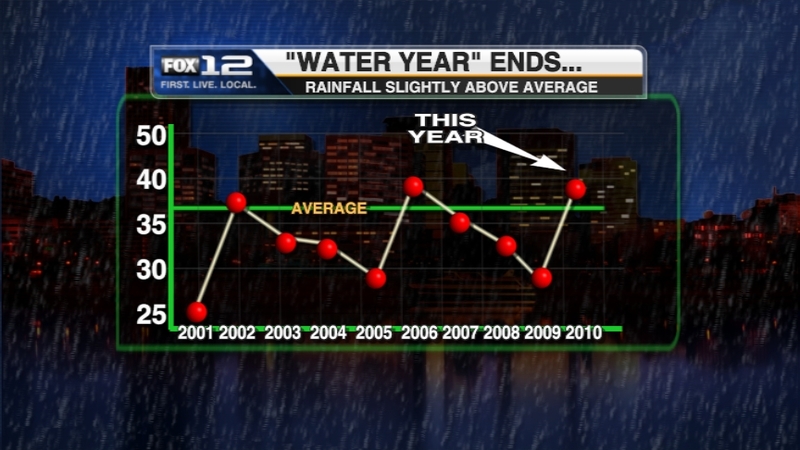 It makes more sense to start the “Water Year” at the beginning of each rainy season. Most meteorologists in our area use October 1st as the start of that year. Sometimes September 1st is used instead. Tomorrow will be the end of the 2009-2010 water year. Now this year is a bit strange because we had such a huge amount of rain in May and June, plus September to a lesser extent. It was actually a pretty dry “wet season” due to the El Nino conditions last winter, but our water year number was salvaged by the wet Spring and early Fall. So we ended up slightly above average. Most of the Pacific Northwest was above average as well. Notice that only 3 of the last 10 years have been at/above average…seems as if the first decade of the century has been a bit drier than normal. I see dewpoints are SLOWLY dropping off this evening as we get a drift of drier air coming down from the north. The good news is dewpoints are much lower to our north (low-mid 50s in Puget Sound), and we get increasing north and northeast wind the next 48 hours. That should bring us back down into “normal” territory by midday tomorrow. Basically the humid weather is finishing up this evening. Temperatures are dropping more quickly this evening as a result too. We had 3 consecutive record warm lows (61, 63, 63) at PDX, which appears to be the first time in 10 years we’ve seen such a warm stretch…and highly unusual for the last half of the month too. Two real nice days ahead with slight offshore flow tomorrow and stronger easterly flow on Thursday. 850mb temps peak out near +20 C on Thursday too. That should push us well into the 80s. With the decreasing sun angle and daylight hours, it becomes very hard to get temperatures much above 80 over the next couple of weeks. But conditions are perfect for that to happen on Thursday. A weak shortwave trough passing overhead Friday morning gives us a southwest push. Our RPM model and the WRF-GFS say widespread low clouds in the Valley the first part of the day. That’s a tricky forecast because in early October once you get the low clouds in the Valley they can easily be stuck there most of the day. I’ll ignore that for now and go for mid 70s. Beyond that a stronger trough comes through here very late Sunday or Monday. That’s the next chance for rain. But it’s not the start of a wet spell…it appears a longwave ridge wants to stay nearby for a good chunk of next week too. Hopefully it’ll be nice and dry again, although I see the 00z GFS is looking similar to the humid pattern we just had…plenty of rain to the north and warm air down here. Only a weather geek can get pumped about some incredibly high dewpoints…but even regular folks can understand how amazingly humid it has been the last 24 hours in the Pacific Northwest. Sure, it was humid a couple weeks ago, which was very unusual for mid September. But now even worse? Check out some of the dewpoints this evening (a direct measure of the amount of water vapor in the air). As of 9pm many areas are hitting their highest of this warm season so far. PDX has hit 67 (not to wildly high), but Scappoose-68, Olympia-69, Tillamook-72!, Lincoln City-71, Vancouver-67, Troutdale/Hillsboro-66, Hood River-66 (very rare). I could swear such high humidity/dewpoints have become more common the last 4-5 years, but don’t have any hard facts to back it up. That would take a lot of searching through weather records. I can say that I looked through the last 6 summers at PDX and only last summer (2009) for a few hours did we hit a dewpoint of 67 & 68 at the end of the heat wave. The closest to that was a dewpoint of 70-72 during that extremely humid event late July 2006. So it’s fair to say that this is one of the 3 most humid periods in the last 6 years. Looking ahead, some really nice weather on tap for the rest of the week. For starters, the passage of a wind shift line/cold front tomorrow evening brings the wind around to the north, pushing the deep tropical moisture out of here. That spells a sharp end of our “sweaty spell”. Model cross-sections show it really well as well as MOS data. The the northerly wind turns northeast and easterly Wednesday afternoon through Thursday. Dewpoints may drop into the 40s as the atmosphere warms up again. So the last two days of the month should give us a very typical late September warm spell. Overnight lows should drop down to around 50 in the city as well. A weak system moves through our warm ridge Friday, but then it rebounds Saturday and Sunday for a nice weekend. No sign of stormy weather in sight (the first few days of October). 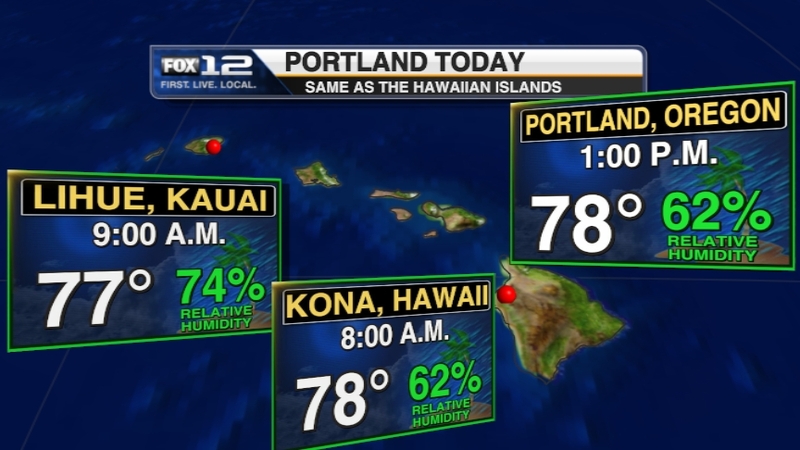 By the way, I should point out that at Kona and Lihue, afternoon temperatures were about the same at PDX, but just slightly more humid, so in the end we WERE much the same as the Hawaiian Islands today! Got back from a (very brief) beach vacation and then sat through an entire day of drizzle, light rain, and gloomy weather at home. But at least my garage is all cleaned and vacuumed out, fish tank is spotless, and I have fresh shirts pressed for the upcoming workweek. We camped at Manzanita (Nehalem Bay State Park). That might be one of my new favorites, although I hear it can get rough in summertime with the northwest wind cranking around Neah-Kah-Nie mountain. We just had light south wind Friday and Saturday which was perfect. Forgot that EVERYTHING gets wet when you have a clear night at the beach…geez, couldn’t believe the condensation outside AND inside the tent. That reminded me why I prefer camping in the mountains and drier eastside of Oregon. Hard to believe we can go the entire summer with really no humid weather, and then we get round #2 of tropical moisture in less than two weeks during the last few days of September. Dewpoints are once again back into the 60s this evening due to a very warm and moist airmass moving up from the tropics around the Dateline. Check out the precipitable water image…widespread 1.25″+ area from Vancouver Island to just off California that extends all the way back to northwest of Hawaii. I haven’t analyzed maps in detail like I would at work, but I’ve seen enough to realize the next two days and anights will be very warm and humid. More record warm temperatures on the way most likely. I notice the WRF-GFS and our RPM keep temps near/above 60 through Monday night. That’s very unusual for early Fall. Bascially the moisture is here (low level and higher up) with nowhere to go until we start getting some light offshore flow to dry things out on Wednesday here at the surface. For that reason it’s hard to believe a “mostly sunny” forecast for Monday, probably more like partly cloudy. But with a temp starting in the lower 60s…80 won’t be too far away with some sunshine….regardless, it’s going to be a very humid and warm day Monday! Here’s the forecast from our RPM model for this weekend…very light rainfall across Northwest Oregon and Southwest Washington. There has been quite a battle between the models over whether a weakening cold front will move down into the Pacific Northwest on Sunday or stay offshore. The ECMWF was first earlier in the week showing the front holding together for a rainy day Sunday. The GFS finally decided to come on board last night and still looks exactly the same 24 hours later. We’ve had at least a chance of showers in the 7 Day forecast each evening here at FOX12, so hopefully our viewers have the message that Saturday looks great and Sunday is risky for outdoor activities. So I was REALLY annoyed when I heard a local meterologist’s forecast on a radio station today (not KPAM, our news partner) saying that we had a “warm and sunny weekend” on the way. Ughh! I hate disappointing the public…I can already hear people on Monday saying “it was supposed to be sunny and warm all weekend!”. At best we’ll have lots of clouds Sunday and dry weather. At worst it’ll rain all morning. Most likely somewhere inbetween. Beyond that…next week looks great! In general a warm and dry end to September. As of now I sure don’t see any “hot” weather. I would consider “hot” the last few days of September to be 85+ degrees. Regional Weather Experts Will Once Again Descend On Portland To Predict This Coming Winter’s Weather! 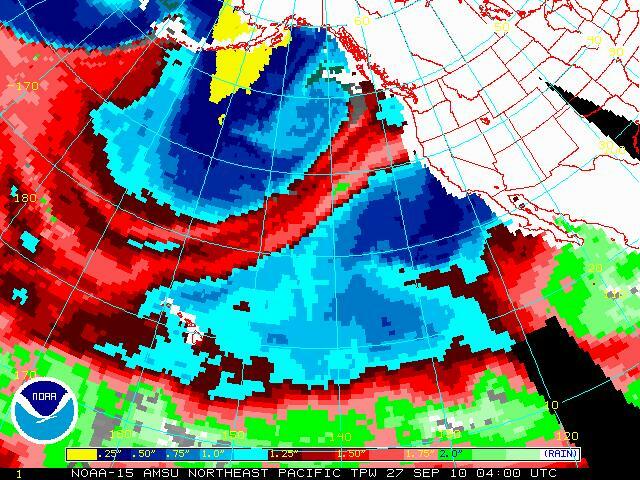 (Portland, Oregon – September 23rd 2010) – La Nina is back! The Portland International Airport recorded its wettest June in history this year, along with its coldest summer in 17 years. Records fell all across the Pacific Northwest this spring and summer. Is our record setting weather expected to continue into the winter months? What about our chances for low elevation snow? 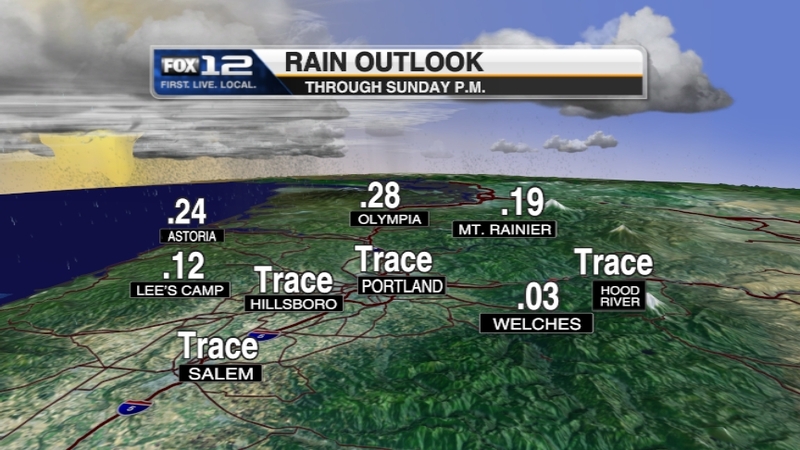 You are currently browsing the FOX 12 Weather Blog blog archives for September, 2010.